So, a friend of mine had this idea for me to have an open house ice cream tasting party, and ambivert that I am, I decided to take the dare. And this is the excuse I’m using for making all these crazy ice cream flavors. Got it? I do need to think of some non-fruit flavors, because variety is a good thing at a tasting party…but here’s another fruit-based ice cream anyway. I don’t remember the search I did on Pinterest that led me to this one, but once I read the recipe, I had to try it. Here’s the original recipe…and do yourself a favor and don’t look at this blog if you’re jonesing for ice cream and don’t have any…there are some truly droolworthy recipes there. Banana Curry Ice Cream – Scoop Adventures. The sweet curry I made includes 1 tablespoon each of cumin, cinnamon, nutmeg, cardamom, ginger, and turmeric, plus 1/2 tablespoon of cloves.The recipe I found also called for 1/2 tablespoon of fennel or anise seed, but I didn’t have any. 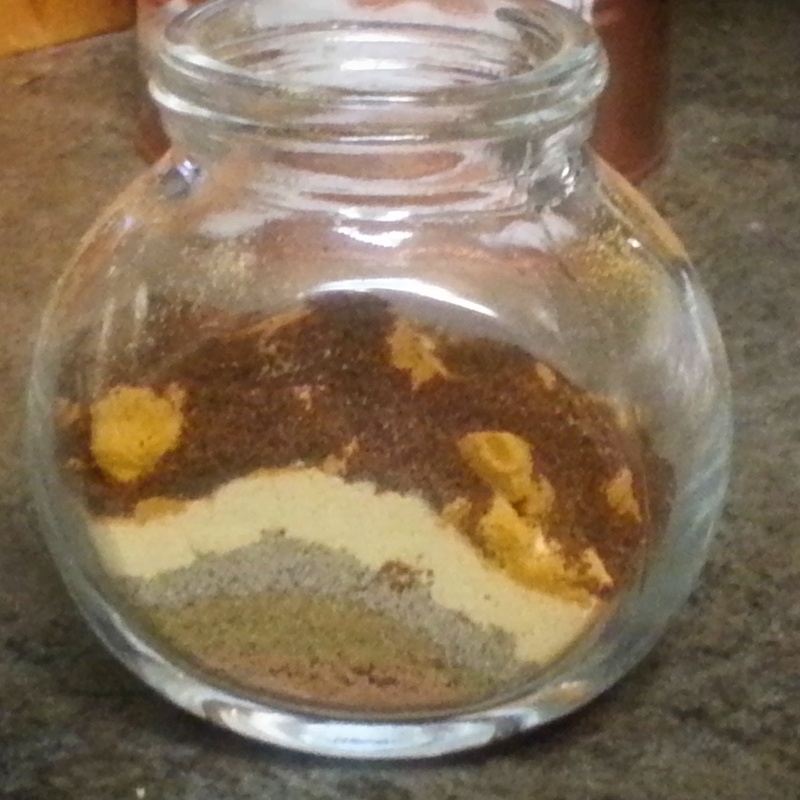 Here’s a pic of the layers in a spice jar before I shook it to combine; isn’t it pretty? I followed the recipe with a few adjustments: I added about 1/2 cup of heavy cream, because I had an open container to use up, and I doubled the lemon juice. After the mix cooled, it seemed really thick, almost like the peanut butter ice cream I made last weekend, but I went ahead and ran it through the ice cream maker, not knowing what, if anything, to do about it. Like the peanut butter ice cream, I only let it churn for about 10 minutes and the resulting ice cream was sticky and thick. I toasted up some roasted & salted cashews to balance out the sweet banana flavor and stirred those into the mix before letting the ice cream harden and ripen in the freezer. The final product is really hard to scoop (again like the peanut butter recipe), but I love the flavor. It’s not like any other banana dessert I’ve ever had: the curry makes it seem exotic, and the crunchy and slightly salty cashews married beautifully with the sweet and sticky banana. I’ll have to play with this one to figure out how to loosen up the texture without diluting the taste. As always, I’d love to hear from you with comments or suggestions! Thank you, Lindsay! I only reduced the churn time because, although the bowl was still spinning, the ice cream was just sitting in a stiff blob… It didn’t seem as though any more air was getting in. I’m sure a thinner base will help next time. Wow, that sounds amazing!! Exotic indeed!